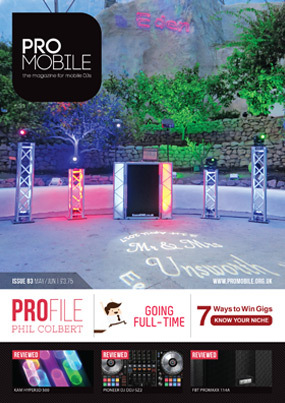 Packed with news, views and reviews, Pro Mobile is a source of ideas, advice and inspiration for all professionally-minded mobile DJs. Highlights of issue 84 include 10 tips from ex-banker turned mobile entertainment company owner Peter Holding for becoming a full-time DJ as well as a light-hearted tale of misheard song lyrics from Mastermix Label Manager Richard Lee. There's also advice from Fabio Capozzi on defining your niche as well as mixing tips from Brian Mole. There's also a great collection of reviews of the latest mobile DJ gear including FBT Audio's PROMAXX 114A 14" powered speaker, Pioneer DJ's DDJ-SZ2 controller and Ibiza Light's impressive 9BEAM-MINI lighting effect. Is this brief but insightful article, Euan Bass suggests that older customers could prove to be a lucrative untapped market! NADJ London chairman Chris Binns poses the question: are you doing enough to take care of yourself out on the road? Andrew Broughton, Brian Mole, Chris Binns, Eddie Short, Euan Bass, Fabio Capozzi, Ian Forest, James Humphrey, Leslie Ball, Peter Holding, Phil Colbert, Richard Lee and Stu McLaren. ADJ, Bose, BPM | PRO, Cameo, Chauvet DJ, DAP Audio, Daslight, dB Technologies, DJkit, DJ Event Planner, DJ Superstore, DMC, Equinox, Fabtronic, FBT Audio, Ibiza Light, Ibiza Sound, IMG Stageline, Insure4Music, Laserworld, LD Systems, Kam, Mastermix, NovoPro, Peavey, Phase One, Pioneer Professional Audio, Proel, QSC, RCF & Yamaha.